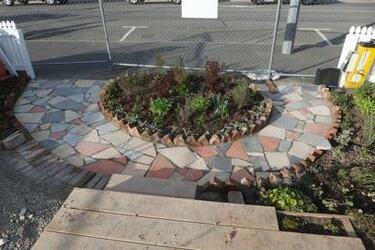 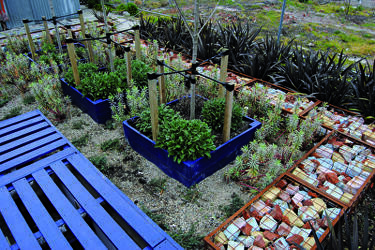 A photograph of the paved path in the Green Room garden on Colombo Street. 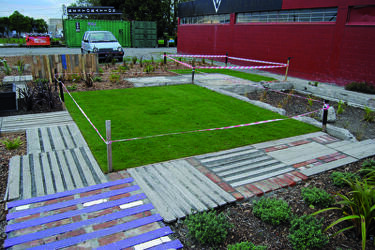 The path was designed to travel around the garden, leading up to the platform holding Crack'd for Christchurch's armchair and ottoman artworks. 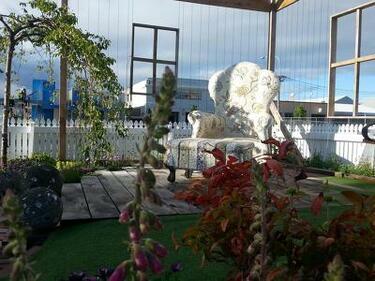 Crack'd for Christchurch comments, "The Green Room was built by Jonathan Hall and planted by Gina Payne." 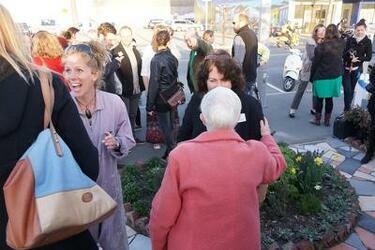 A photograph of members of Crack'd for Christchurch in the crowd during the launch of the Green Room on Colombo Street. 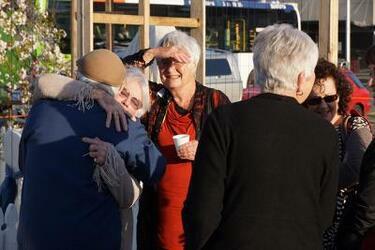 Crack'd for Christchurch comments, "From left: Alan Campbell, Shirley Walden, Helen Campbell, and Kathryn Innes." 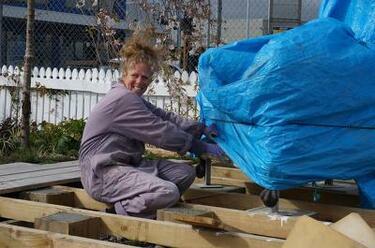 A photograph of Marie Hudson lifting a tarpaulin to examine Crack'd for Christchurch's armchair artwork in the Green Room garden on Colombo Street. 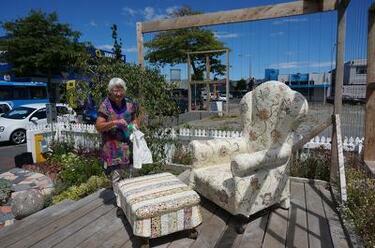 The armchair has just been lowered onto a platform in the garden. 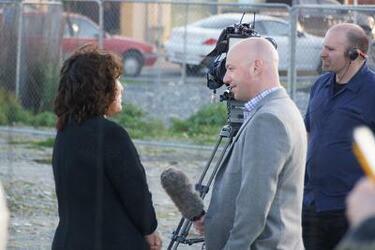 A photograph of Mike Thorpe from Seven Sharp interviewing Jenny Cooper during the launch of the Green Room garden on Colombo Street. 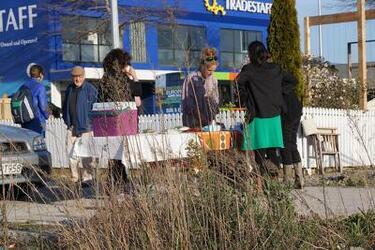 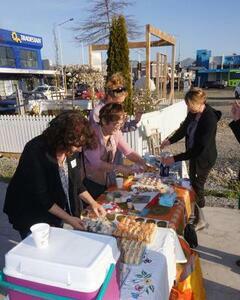 A photograph of members of Crack'd for Christchurch setting up refreshments for the launch of the Green Room on Colombo Street. 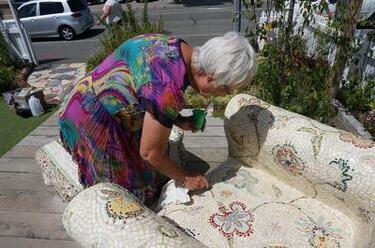 Crack'd for Christchurch comments, "From left: Jenny Cooper, Sharon Wilson, and Marie Hudson." 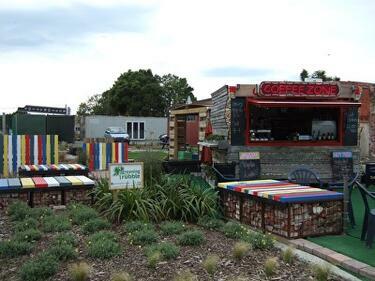 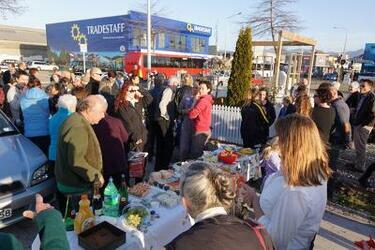 A photograph of a truck transporting Crack'd for Christchurch's armchair artwork along Ferry Road. 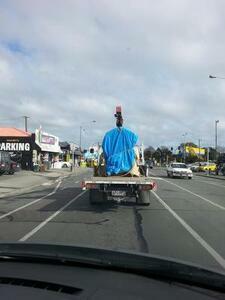 The armchair has been wrapped in a tarpaulin and secured to the back of the truck with rope. 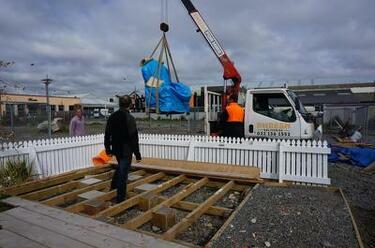 A photograph of Crack'd for Christchurch's armchair artwork being lowered onto a platform in the Green Room garden on Colombo Street. 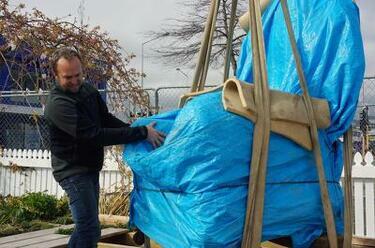 The armchair is wrapped in a tarpaulin. 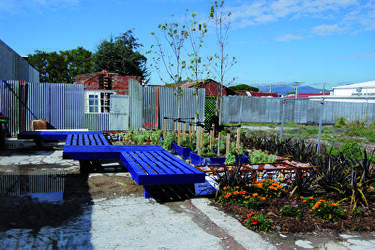 A photograph of a garden area and coffee kiosk on Colombo Street. 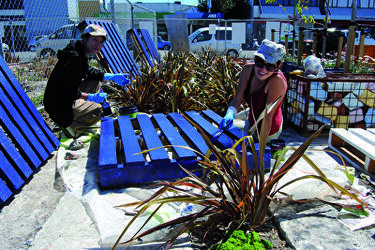 Crack'd for Christchurch comments, "From left: Jenny Cooper and Marie Hudson."